In addition to teaching at St. Patrick Seminary, Father Weber has served as the founding director of the Institute of Sacred Music in the Archdiocese of St. Louis and Magister choir of the Cathedral-Basilica of Saint Louis. He has served as a faculty member at Kenrick-Glennon Seminar, Wake Forest Divinity School, and St. Meinrad’s College. 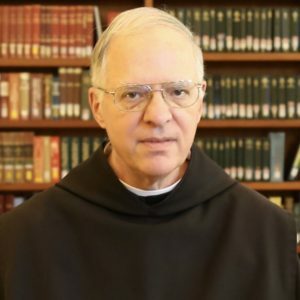 He received the Licentiate in Sacred theology with a specialization in sacred liturgy and monastic spirituality from the Pontifical Athenaeum Sant’ Anselmo in Rome. He studied Gregorian Chant with Dom Eugene Cardine as wellas music history and composition at the American Conservatory of Music in Chicago.